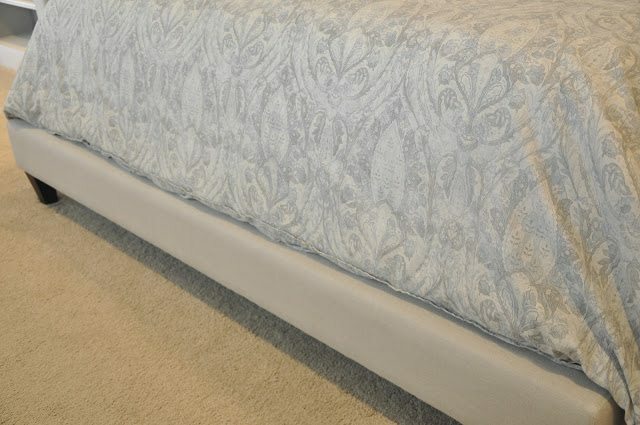 After about 3 weeks, our upholstered bed arrived from Overstock (Aisling Cream Fabric King Bed) and we ended up pairing it with a duvet cover and shams from Restoration Hardware. I should actually say “sham” because I got the last one in stock, and had to order the mate, which hasn’t yet arrived. The bed wasn’t difficult to assemble, but it took over an hour, and definitely wasn’t as easy to put together as our previous bed. The headboard is not as tall as I had envisioned (at 43 inches), but I think once we hang something above the bed, it will look much better. 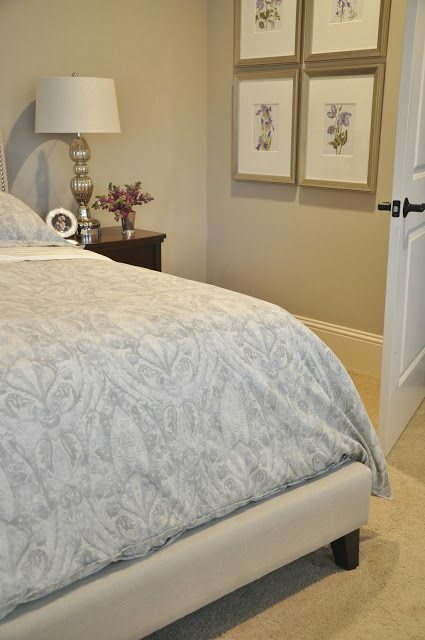 The fabric is a gorgeous cream color that looks like linen, but isn’t specified. The nailhead trim is shiny silver. Here’s a look at the end of the platform. I am very happy with the duvet (Restoration Hardware Italian 19th C. Medallion Bedding in Pacific– currently on sale). It’s a great weight and comfortable 100% cotton, machine washable (I already washed it). I found a pale cream sheet set at Target. We obviously need something above the bed and possibly behind the nightstands. I’m also considering moving these nightstands to the guest bedroom and getting more appropriate side tables for this room. The mercury glass lamp is from Home Goods and I made the botanical wall art last year. All in all, I’m pleased that this room is finally getting a fresh look! Also, my sis-n-law told me about these great duvets from Target (only $25 for a King) that are down-alternative and we bought the lightest (least warm) version and it’s working out great. I’m looking forward to adding more decorative touches to the room and will show you soon! We also added an inexpensive abstract painting and mirrored nightstands. Previous Post Wild for Wedges! Very pretty…I think I'd stay in there all day! Beautiful as always! How do you think the fabric will hold up to any stains? Would you spray it with anything to protect it? I worry my little moneys would get it dirty. I love how the bed turned out! It's a beautiful color. I think the bedding is perfect with it too. I adore that lamp! That's a great tip about the duvet from Target. Hmm I'm thinking I need to trade ours out on our bed for summer so hubby won't be as hot. Beautiful! 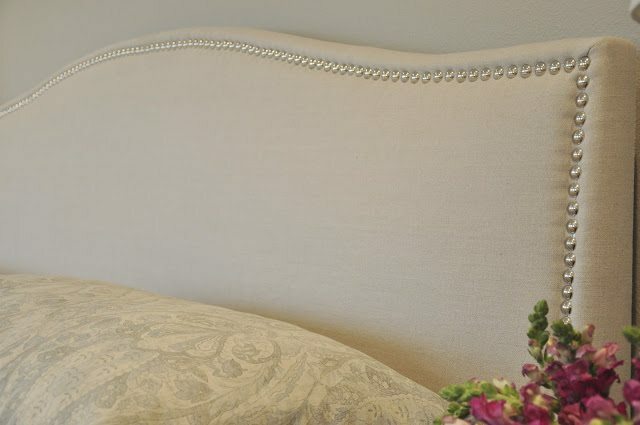 I love the color of the bed and the nailhead trim. This looks really great Megan! I love the new bed with the lighter bedding, very pretty! Megan, it's very pretty. The duvet is a great match. Take your time making the room your own. We love watching your progress! It looks very soft and serene. I love love love the headboard!!! You made such great choices! I'm hooked! It looks beautiful, Megan! Classic and peaceful. Very nice! I like it a lot. What is the brand at Target for the cheap duvets? I have been on the hunt for one myself! Beautiful! I love the color scheme! And those lamps are fabulous!!! It is a gorgeous bed! You must love that room now! O I love it. Great job! I just ordered it, alond with the Restoration Hardware bedding! It looks amazing, great choice! 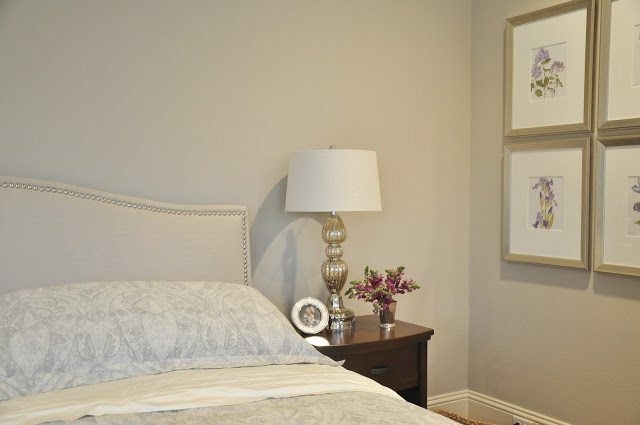 I had been thinking a pair of small mirrors behind the nightstands and saw that your recent living room rearrangement displaced a pair–you might consider putting them behind the nightstands (perhaps after painting the frames), at least to see how you like mirrors there. Really like the studded headboard! its looking beautiful Megan! Head over to HomeGoods-they have some awesome sunburst-style mirrors right now that would look perfect above the bed. Absolutely love the new bed, Megan! It looks great! Fabulous find. The quality of the headboard and foot board looks really high end. I love how the duvet looks with it. For what ever reason, grasscloth is screaming out to me for behind your bed rather than hanging something. Or even a tone on tone wallpaper or stencil. Great job Megan! LOVE IT! So fresh, so pretty. Great job! Love it! I had been anxiously waiting to see the headboard in your room! This looks really nice! I love the lamp and the prints, and of course, the new bed and bedding! My bedroom is always hard for me…after buying tons of pricey printed bedding that never works out as I envision it, I have finally decided to go with white – white everywhere! It's just easier. You did really well – the new bedroom is beautiful! I love the duvet!!! The new bed is gorgeous too. 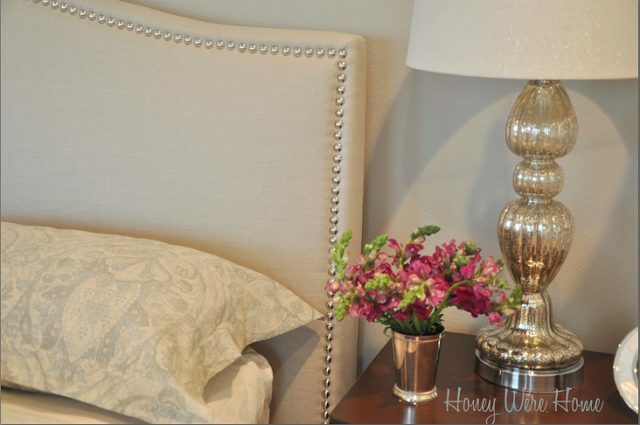 Thank you for the botanical link…I am needing some of those for our guest bedroom. oh my gosh, oh my gosh, oh my gosh, I love it! Good job on picking that! Love the bed and the bedding. How blue is the blue of the Pacific bedding. Looks lovely and soft and i think just what i might be looking for. Love your blog! Just wondering which color choice you chose for the duvet? It looks like the "fog"? Also, I love the bedroom wall color, would you mind sharing? I have the same bed and I love it! It looks so good for such a great price!!! Everything looks beautiful, great choices. I need to start my search for new bedding as well. I love your room decoration. I've been perusing your blog on a lazy Saturday afternoon. I have a RH duvet set similar to yours and thought I'd mention some finds in case you're interested- Land's End overstocks had some great ivory sheet sets for $30-40. I also found matelasse coverlets on JC Penney for $30 each. I got an extra one in a twin size and had Euro shams made for the bed- I couldn't bear to pay the RH prices. Your master suite looks lovely- I'm doing the same thing and lightening up a bit. Pretty bedding and design. Surely anyone who is tired will fall asleep immediately in this cozy and soft bedroom. We are looking to purchase this exact same bed. The headboard is our concern. From the floor to tallest part of the headboard, how many inches is it? We're actually hoping it's 43 inches, but we've seen 52 inches for this same bed on other sites. Hey Megan! I love that bed! I'm trying to envision how it would look in my room (it would be up against a window so I don't want a very tall headboard) and I was trying to figure out the height of the headboard. I am strongly considering ordering this bed but I want to use it without the inside slats so that I can drop my ergo adjustable bed frame into the hole around the side slats and headboard/footboard. I emailed the manufacturer but can not get a clear answer. Since you put it together do you think it would work without the inside slats? Are there any pieces sticking out into the hole if the slats are removed. I would greatly appreciate any and all help that you could give me. Your house is beautiful! Hi Susan, sorry for my late response. My husband put the bed together, so let me ask him. But I'm not sure what you mean, "are there any pieces sticking out into the hole if the slats are removed?" Can you clarify? Just found your site and loving it! Love your taste in decor. Such great inspiration. I am in the process of redecorating our bedroom and purchasing a new mattress as well. What type of mattress do you have? There are so many to choose from! Your home is gorgeous! Thank you so much! We bought our mattress at Mattress Firm and just went with an affordable option that was comfortable.